Fable II was a game that I’d almost fallen in love with from the first screenshots. I’ve always said that the first test for how much I’ll like an RPG is its towns, and Albion’s hamlets and bustling marketplaces, all distinctive and reflective of different areas of Britain, brimming with personality, are simply beautiful. It’s the world of Fable II that I fell in love with more than anything, as I spent as much time shopping, charming the locals, and working the property market as I did adventuring and raiding ancient tombs. The story, while interesting enough and possessing a couple of really memorable set pieces, was a means to get to new places, and given that it still has you finding whole new towns right up until the very final quest, it just keeps giving in that respect. I only wish that it could have been more cohesive rather than a collection of unconnected areas, as other games have spoilt me there, but you can’t have everything. It’s still a pleasure just to explore it. But for a game that’s so deliberately accessible, with a combat system that’s based on rhythm as much as anything and a main character who can’t actually die, I still found it rather daring in places. There are two parts towards the end of the story that stick in my mind that act like standalone episodes, one offering a number of interesting moral choices – a theme that’s carried through to the ending, which really does present a conundrum to even the most saintly players – and one being a wonderful change of pace in the middle of the final stretch. I’m eagerly awaiting the upcoming DLC, as much as an opportunity to return to quests that I haven’t finished as a new environment to explore. 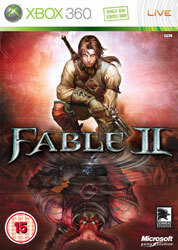 But even as a standalone game, Fable II remains one of my favourites and one that certainly won’t have seen the back of me.